Read below for generator guidelines in reference to the GenerLink transfer switch. You can use the link below to check with our list of compatable generators and make sure you are purchasing a compatable product. If you do not find your generator on our list of compatable generators then please call 800-886-3837 with the make, model number, and your local utility provider so we can check the compatibility as well as the availability in your area. Global Power Products advises you to purchase a generator that is powerful enough to run the largest appliances and motors you need during a power outage. To determine what loads you can support with a portable generator, you must look at both the "running watts" and the "starting watts" requirements of the appliances you want to operate. For example, when your furnace motor first starts up, it will require approximately three times more starting watts for a brief one- to two-second period than the running watts needed to operate it for extended periods. To assist you in determining what loads you can operate on your portable generator, appliance usage tables have been provided with information on running watts and starting watts for common household appliances. In most instances, you will want to purchase a generator with a continuous rating of 4,400 watts up to a maximum of 10,000 watts . 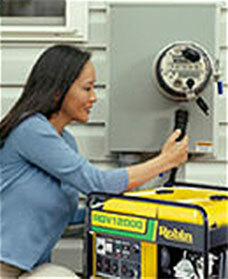 You cannot run your entire home with a portable generator. A typical home supplied with a 200-amp electric service can support approximately 45,000 watts (45kW) of electric demand. By way of comparison, portable generators are marketed in sizes ranging from a few hundred watts to 15,000 watts (15kW). Generators smaller than 4,000 watts are, in most instances, ill-suited for powering a home during a power outage, as they cannot start motors on devices like well pumps and the air handler on a central heating system. At the other end of the spectrum, 10,000- to 15,000-watt portable generators are more expensive, difficult to move, noisy, and consume large quantities of fuel. In most instances, you cannot run your home's central air conditioning system or electric heat pump even with a 15,000-watt portable generator.